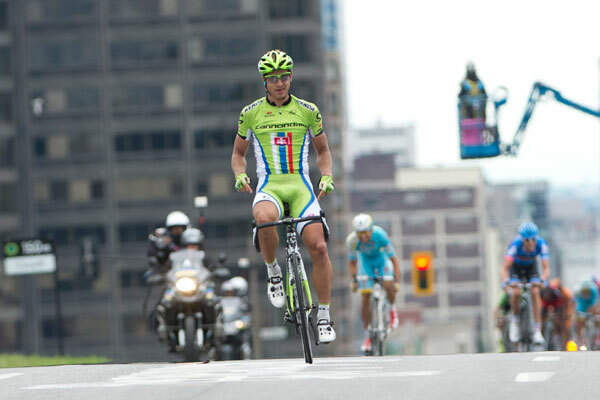 With the World Championships road race two weeks away, Peter Sagan (Cannondale) showed the world that he is ready, putting in a strong late attack in the Grand Prix Cycliste de Montreal to take a solo win. Having been heavily marked in the finale of Friday’s Grand Prix Cycliste de Quebec, Sagan took matters into his own hands in Montreal – attacking on the Cote de la Polytechnique climb in the final 6km and burning everyone off his wheel. Despite a concerted chase from behind, no one could match Sagan’s pace and he eased over the line, smiling and pointing to his legs. Best of the rest was Simone Ponzi (Astana) who claimed second place just ahead of host nation hope Ryder Hesjedal (Garmin-Sharp) in third. “It was hard to win today and this makes me more and more happy,” said Sagan. “I expected attacks in the final kilometres and my thought was the same. I didn’t want any surprises. I waited until the last climb to attack because that was the best moment to make the difference and to go on my own, as well as because I saw the others a little bit tired. Briton Chris Froome (Sky) had once again been active in the race despite losing team-mates Jonathan Tiernan-Locke and Richie Porte to a crash. However, he lacked the top-end speed to make his move on the penultimate climb of the day, Mont Royal, stick. It shows that the Tour de France champion is in good shape and aiming to make his mark on the Worlds road race on September 29 in Florence. But can he – or anyone else – beat Sagan?